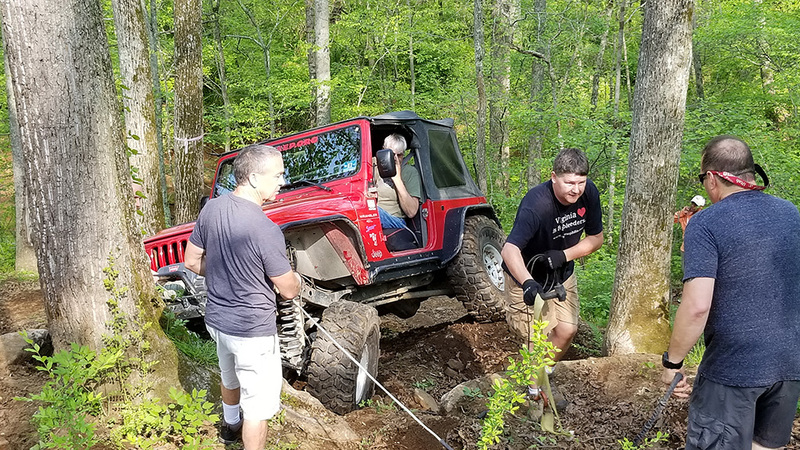 As we have done for several years now a group from CORE was excited to attend Wheeling for Hope this year. 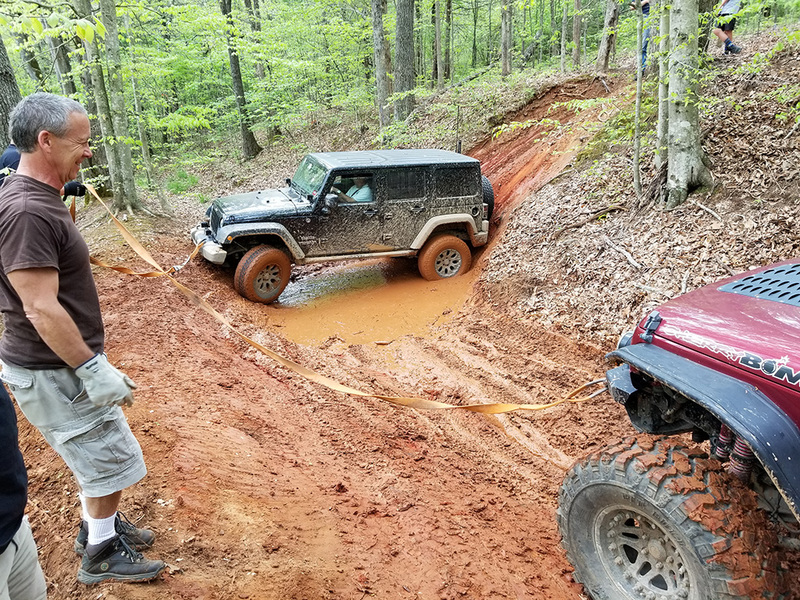 Wheeling for Hope is hosted by a Relay for Life team in Nelson county which helps raise money for cancer research with the funds collected from the event. 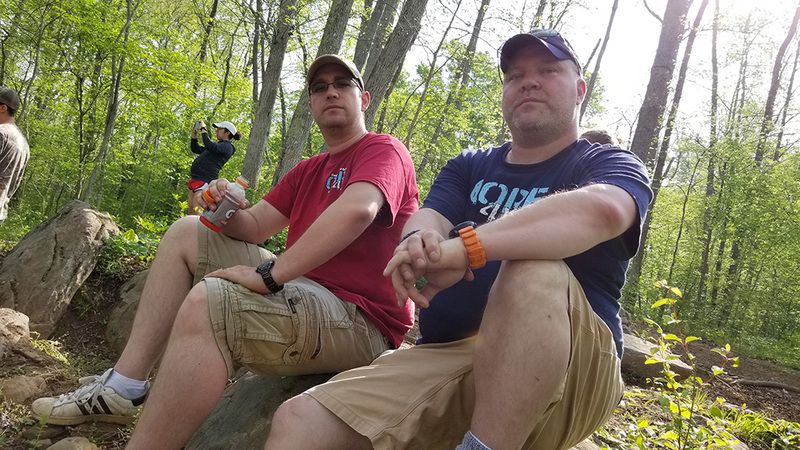 This year was different for those from CORE that attended however since in the week leading up to the event we lost our Treasurer and friend Fred Granruth to an aggressive brain tumor that ultimately took his life. 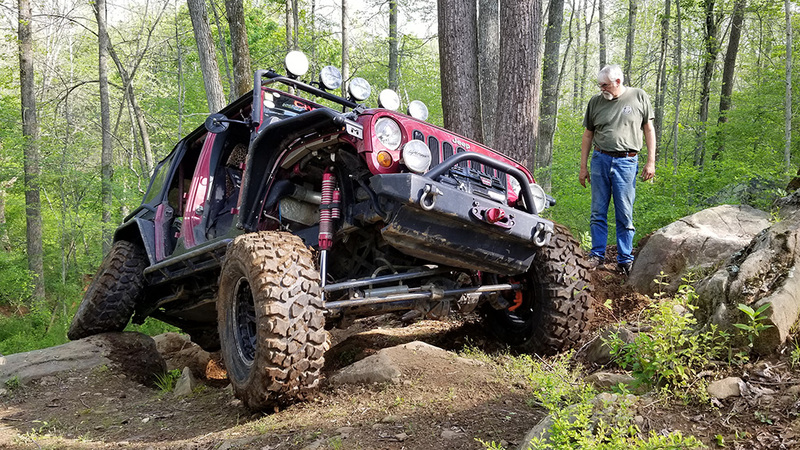 Fred had attended Wheeling for Hope for the last several years, and was always a character on and off the trail. We’ll miss you Fred. 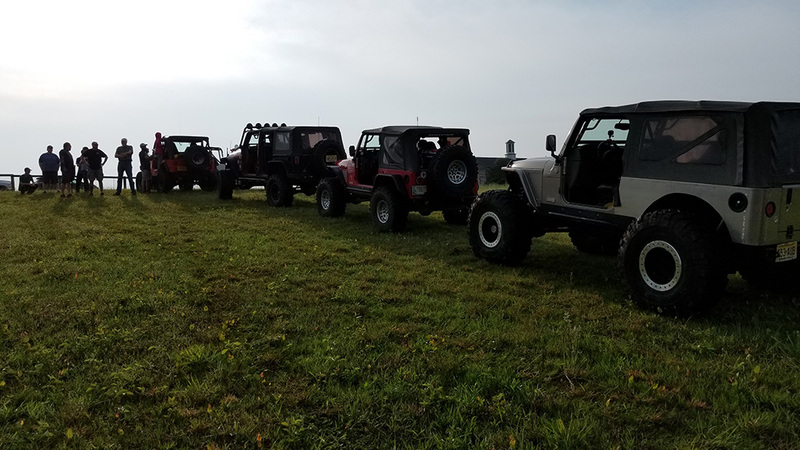 Oddly enough those from CORE that attended the event happened to comprise of the rest of the board so his passing was very much on all our minds. We also met up with a family friend of Cherie’s. 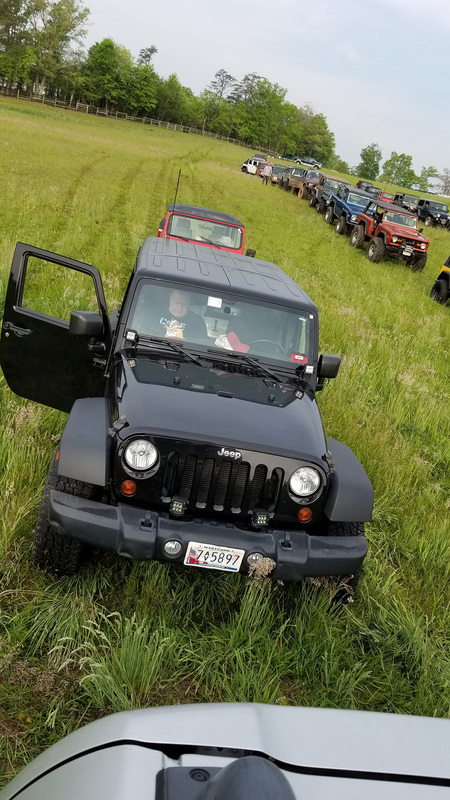 We all arrived Friday afternoon and set up camp at the western end of the field in the Family Section. 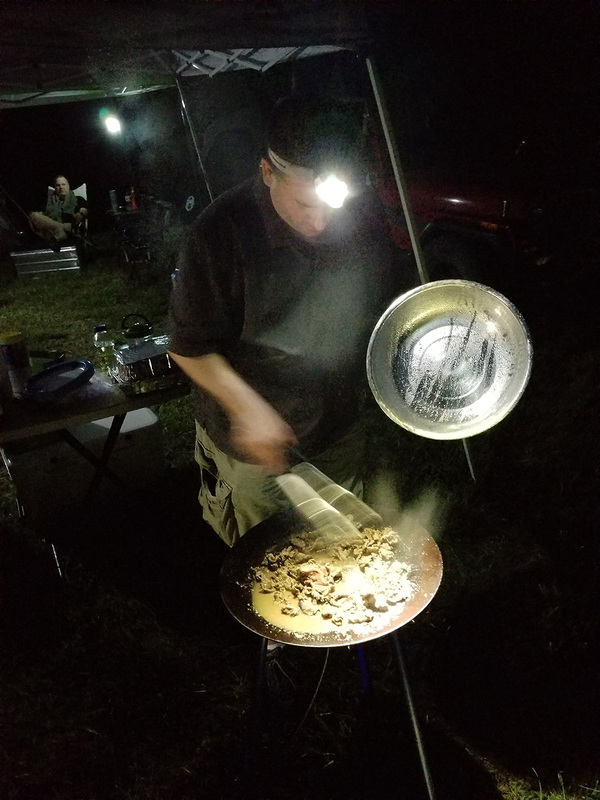 We had decided to do group meals and so Friday night were treated to Philly Cheesesteaks prepared by Sam on Robert’s skottle! 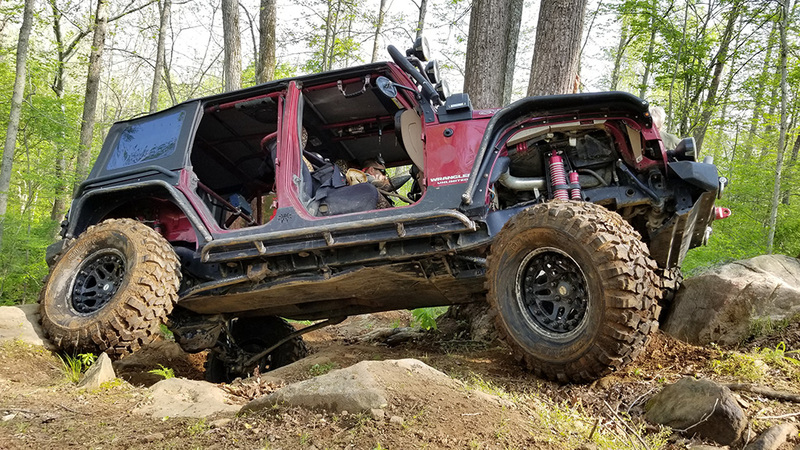 As dinner was prepared Cherie, Jay and I took my rear wheels/tires off (freshly mounted Thursday) and added homemade 1/2in bumpstop extensions which I hoped would keep the new wider tires from flexing into my door seals. 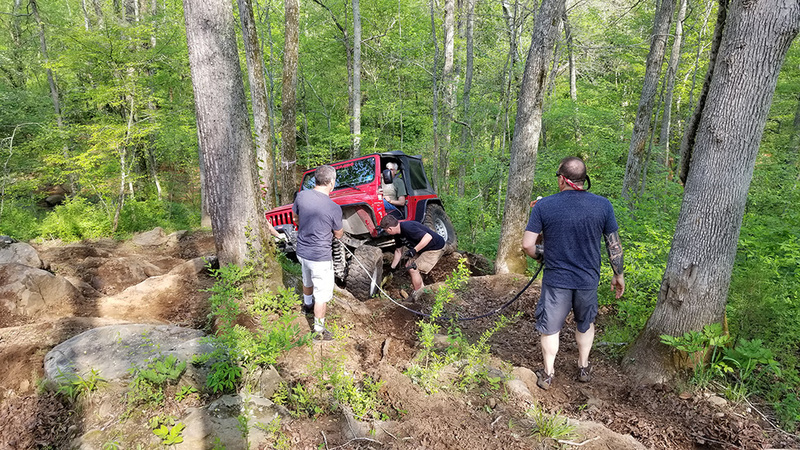 The recovery involved 2 winches and more pucker than I think he was looking for, but was handled with veteran wheeler experience. 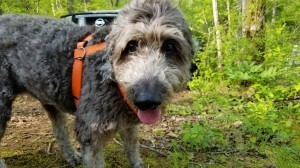 Saturday morning Cherie and I prepared a breakfast scramble for the group complete with sausage and veggies. 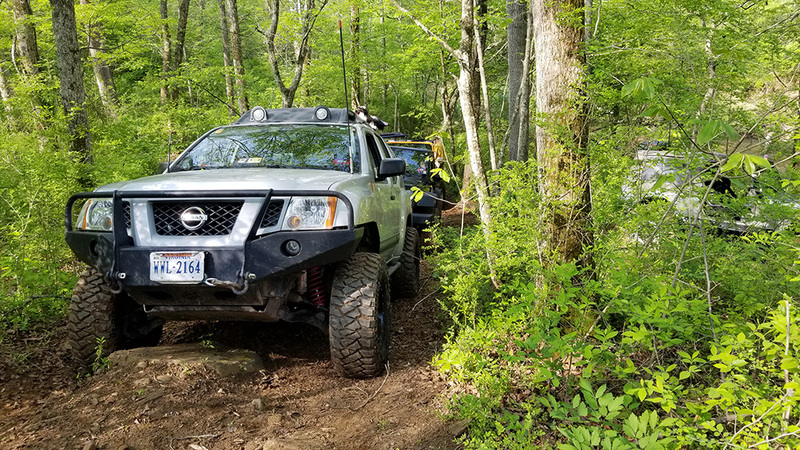 We headed over to the registration tent close to 8 and found ourselves in a group led by Derek, our trail guide from last year, and tail gunned by Eric. 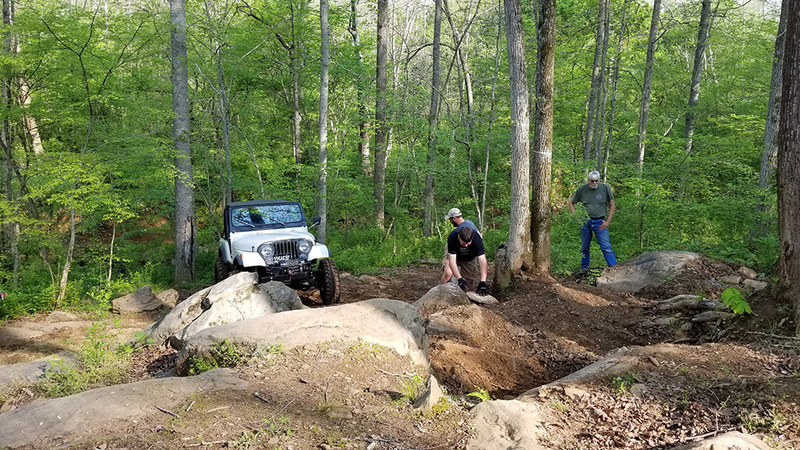 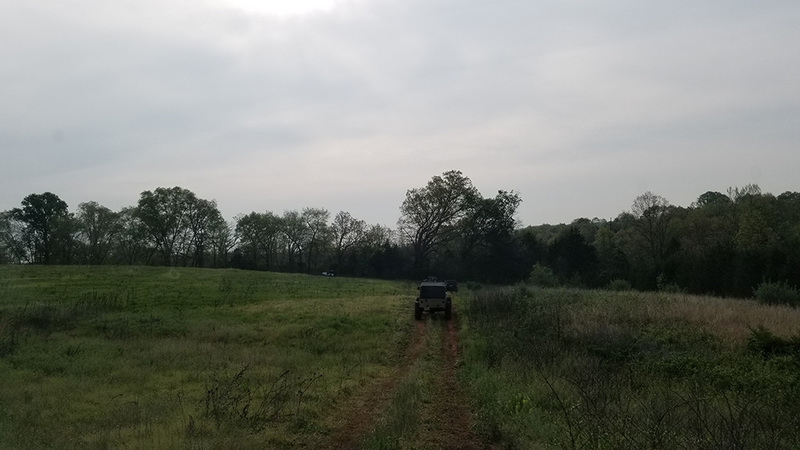 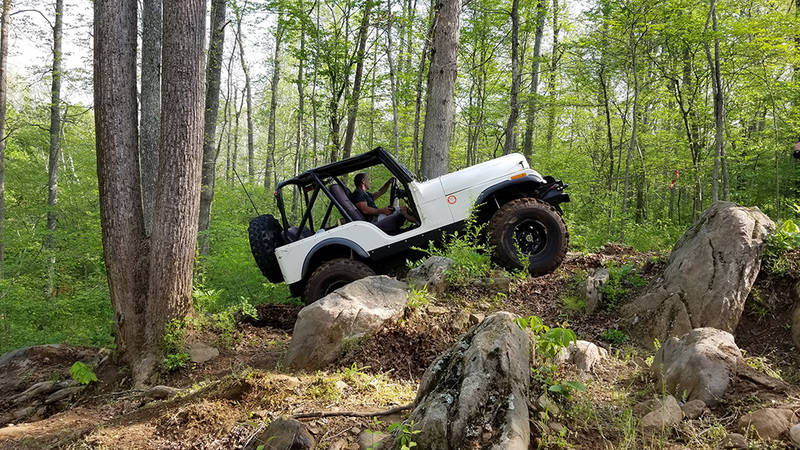 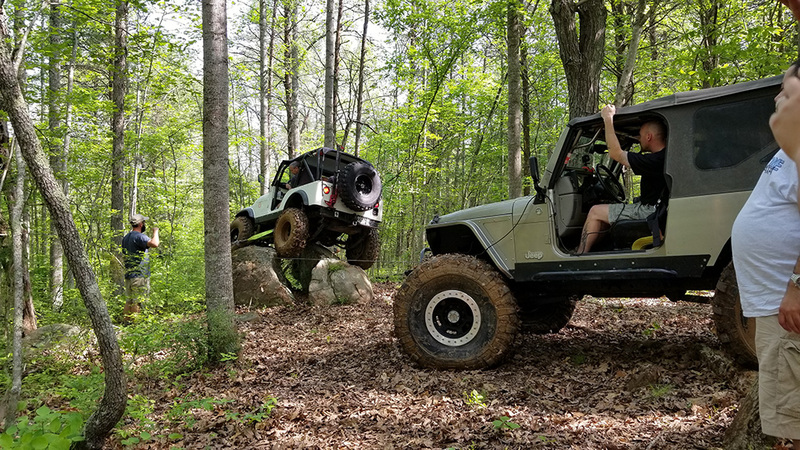 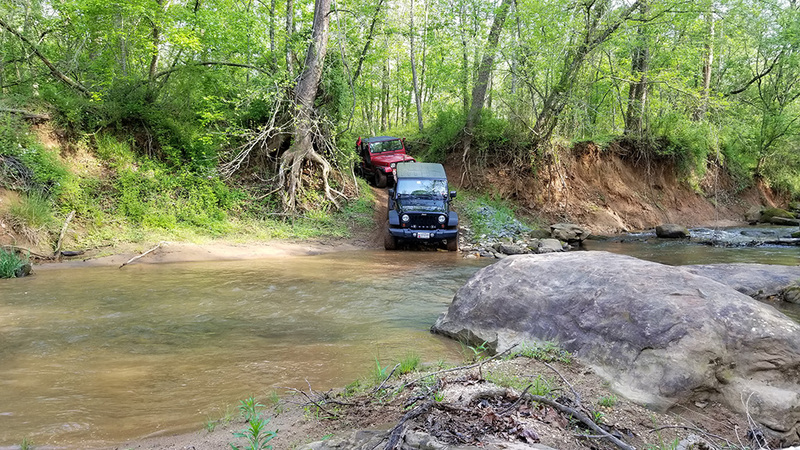 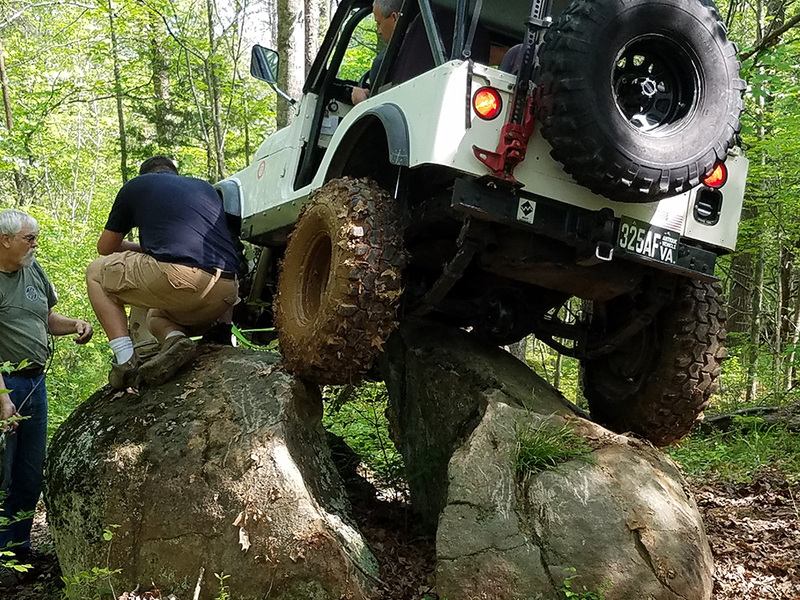 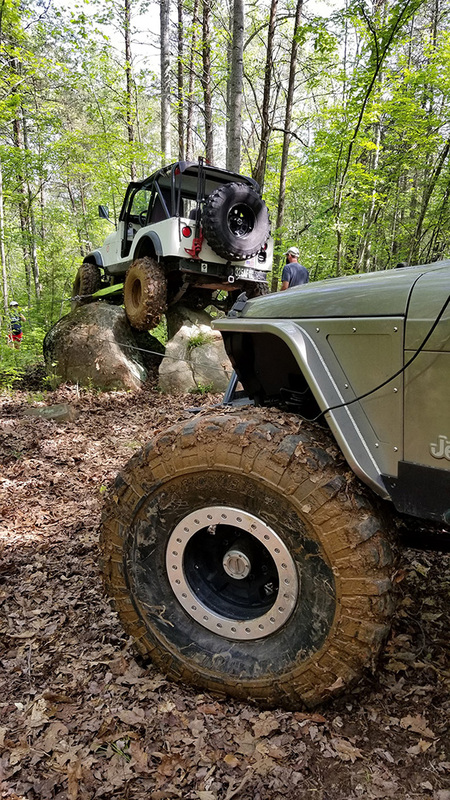 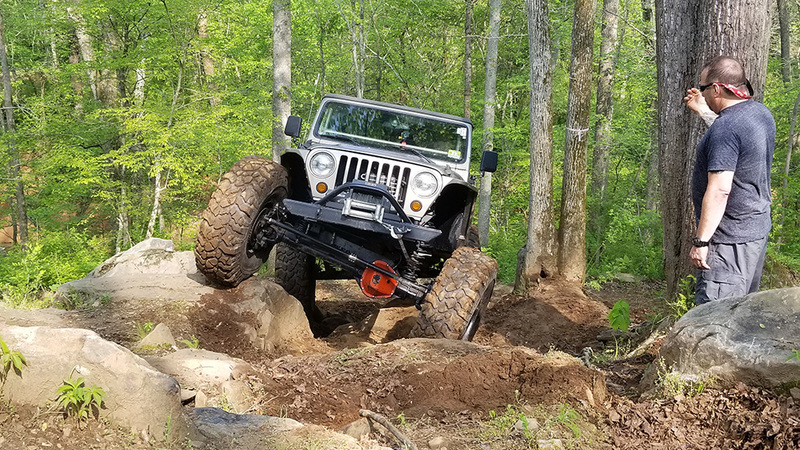 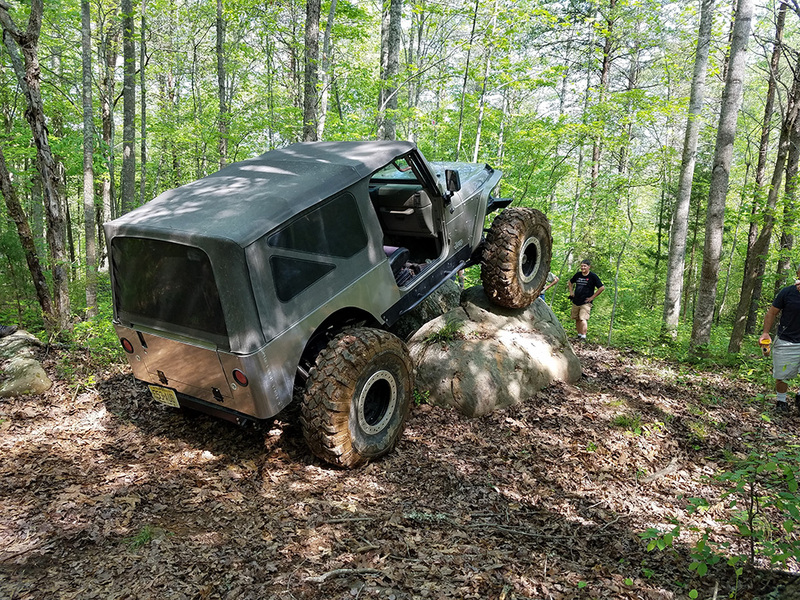 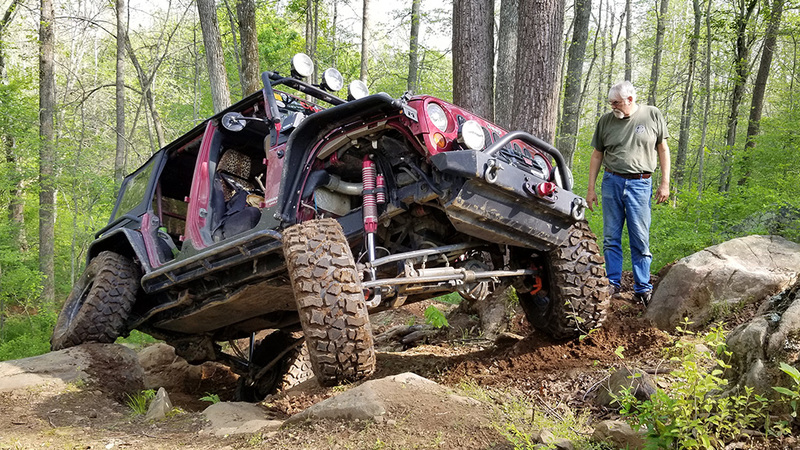 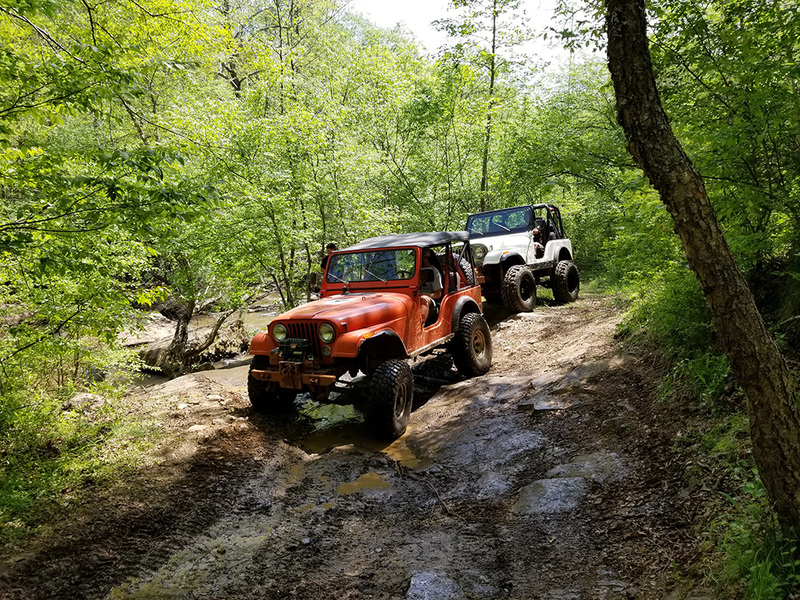 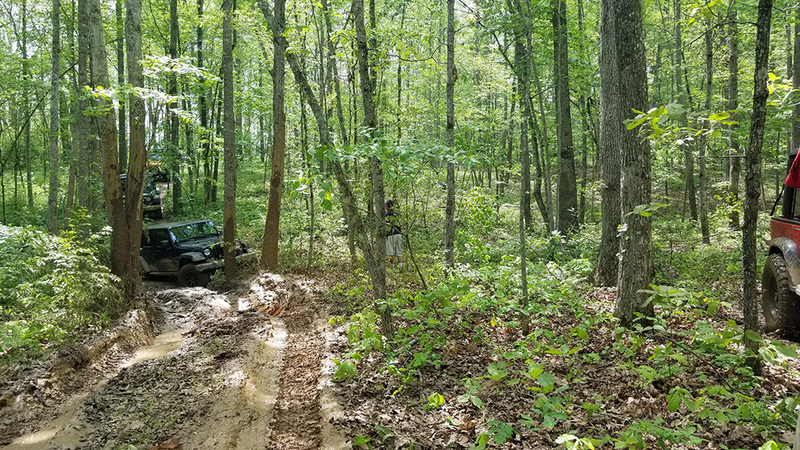 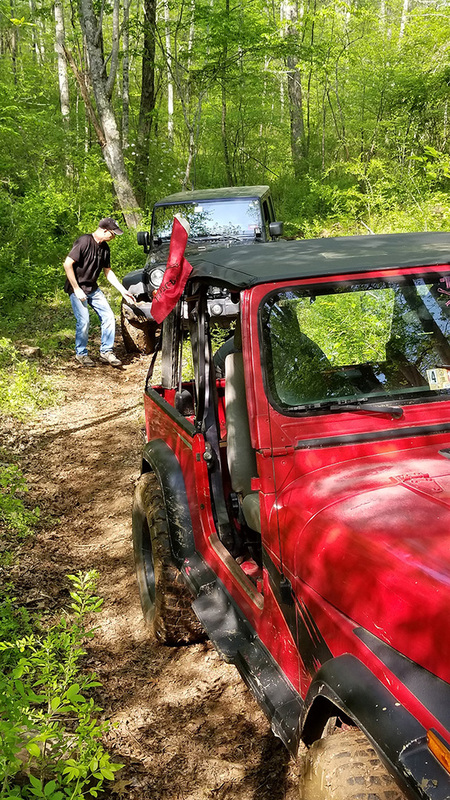 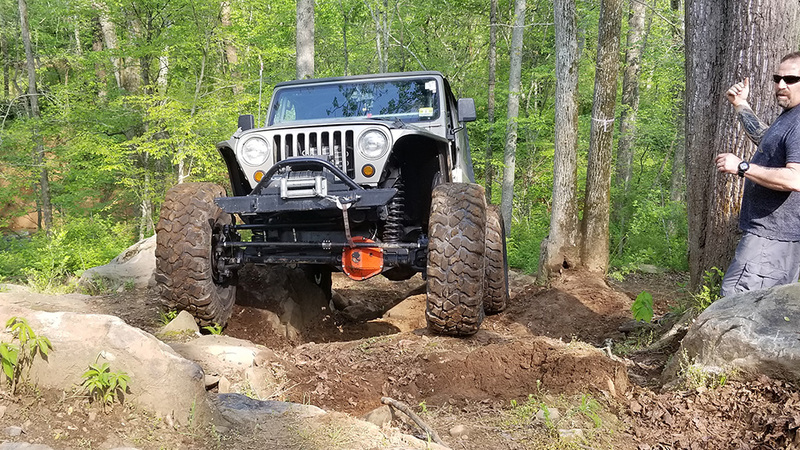 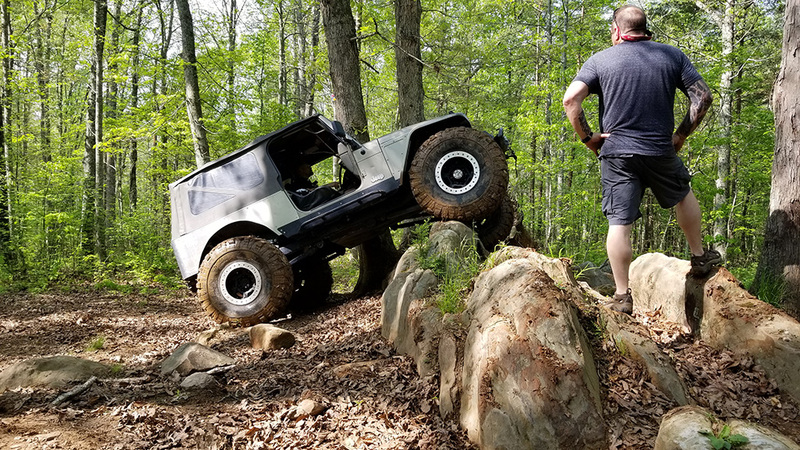 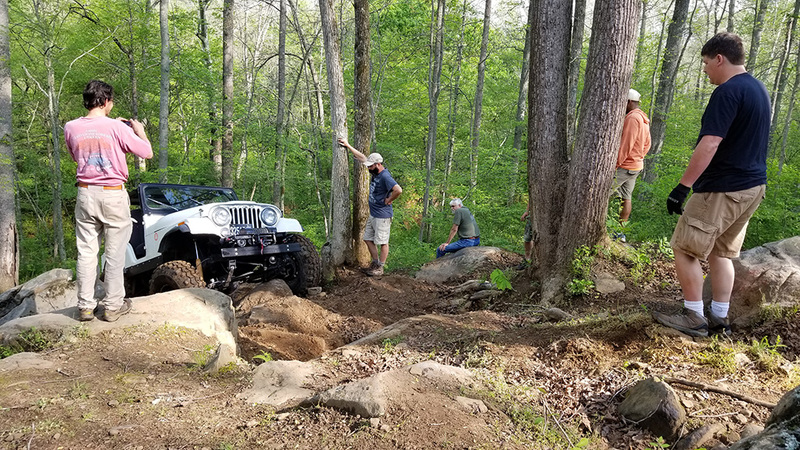 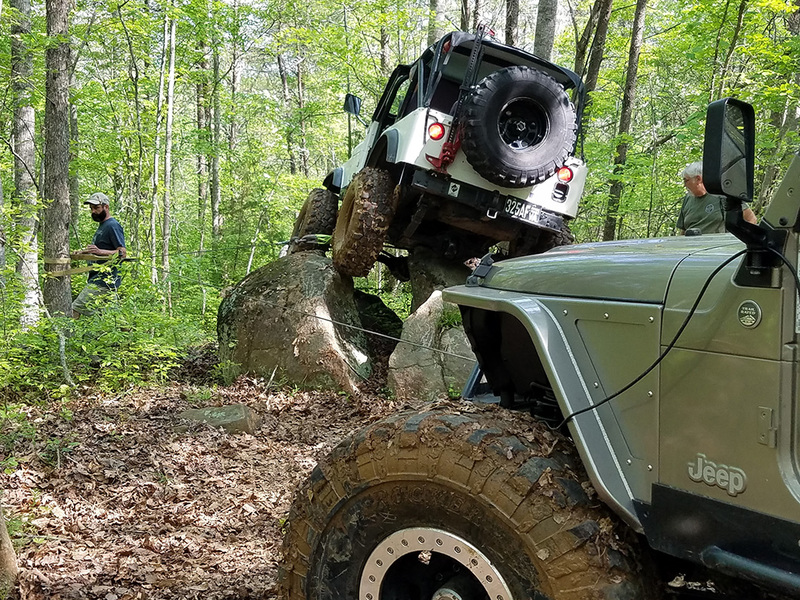 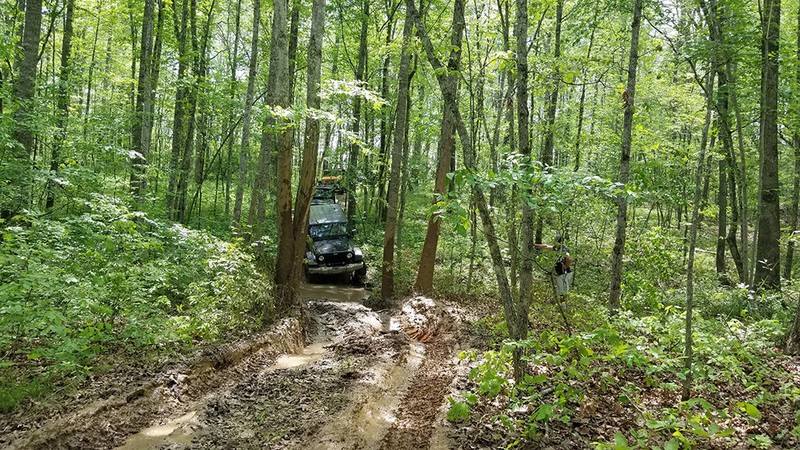 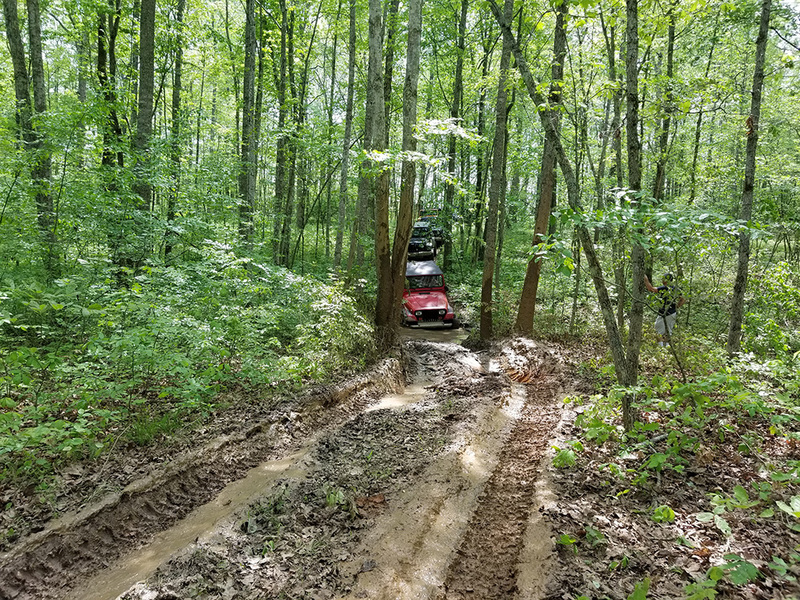 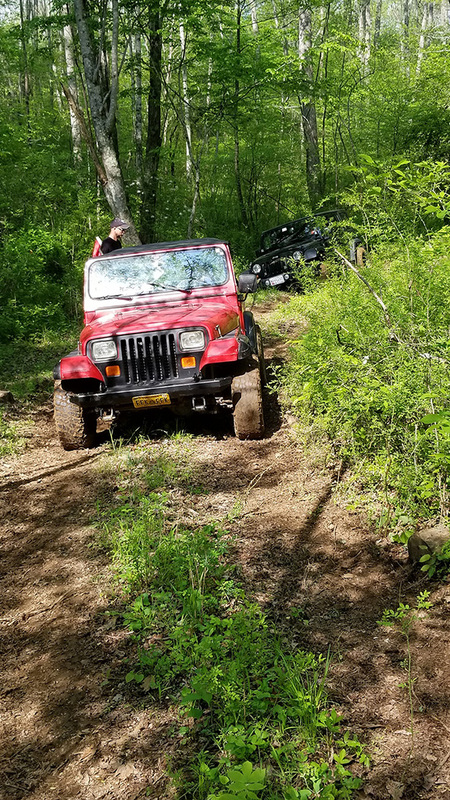 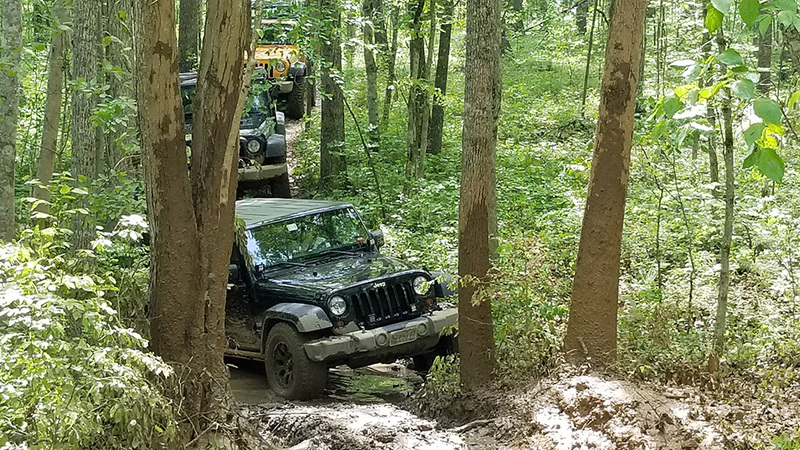 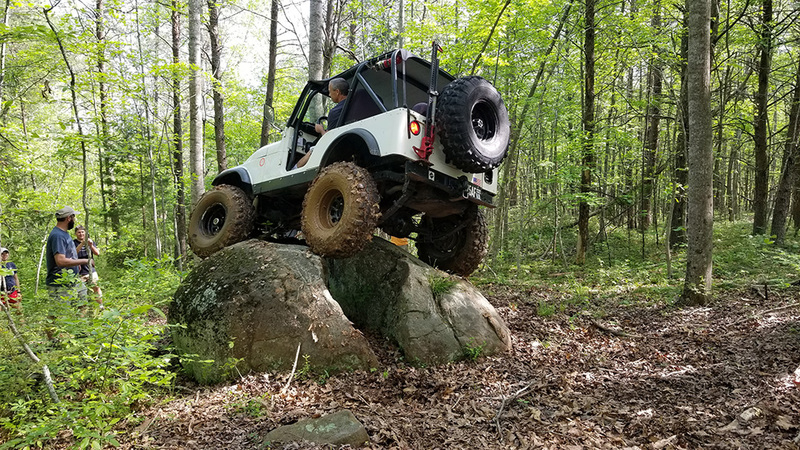 Through the weekend we found out that these two veteran wheelers in their lifted CJ-5’s helped cut the trails 19 years ago out here on Oak Ridge Estate, and are the reason CJ-5 hill is named that! 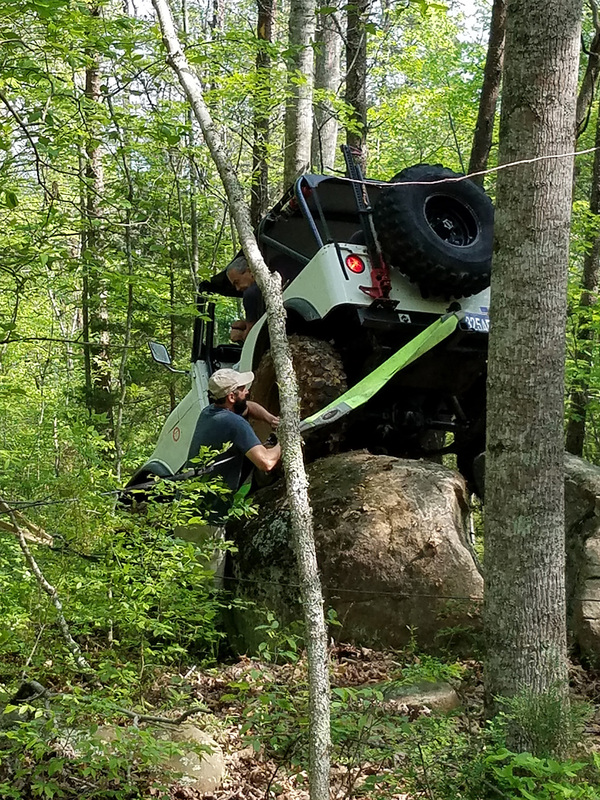 Getting winched off the egg. 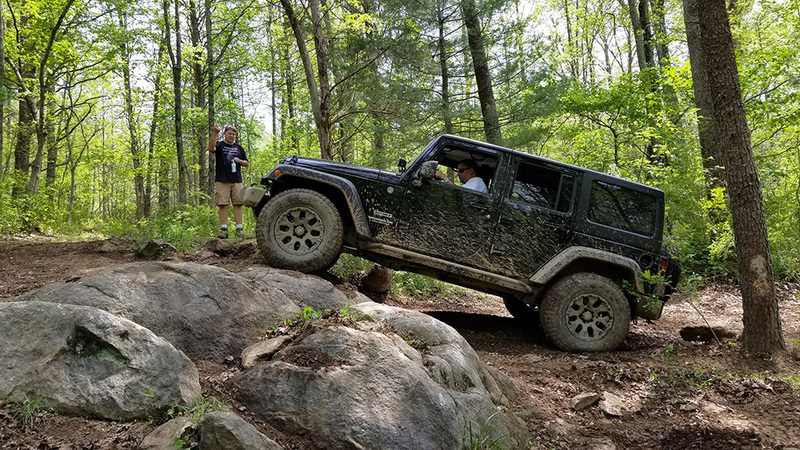 Another highlight of the day was when we got to V-notch. Derek our leader got into a position where his CJ just wasn’t going any further, so the winch was pulled out again. 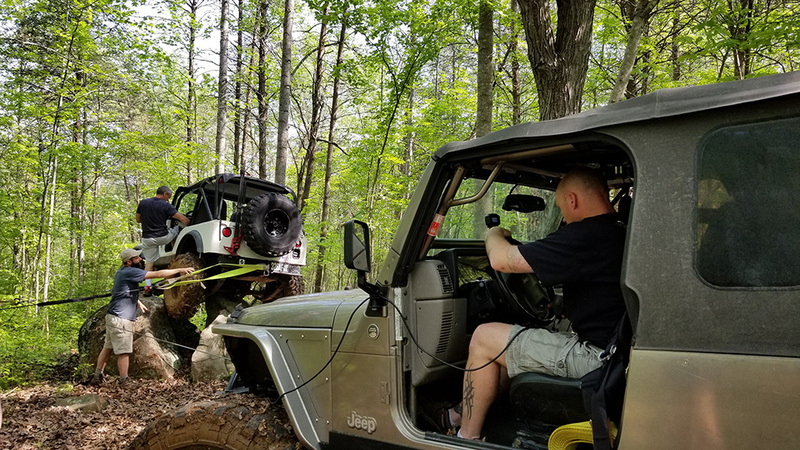 With the controller repeatedly sliding off the very inclined seat I offered to hop in the passenger seat and run the winch for him. 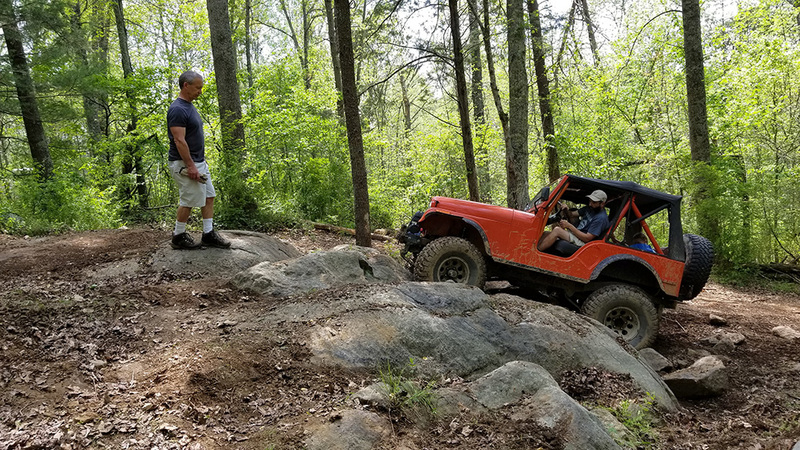 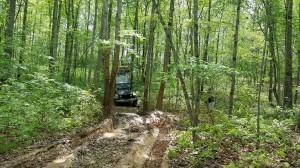 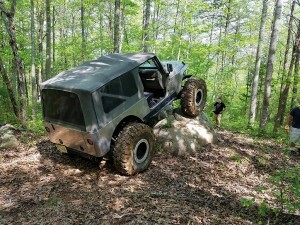 He has a great CJ and it was neat to tackle V-notch, even if I wasn’t driving and we conquered it under winch power! 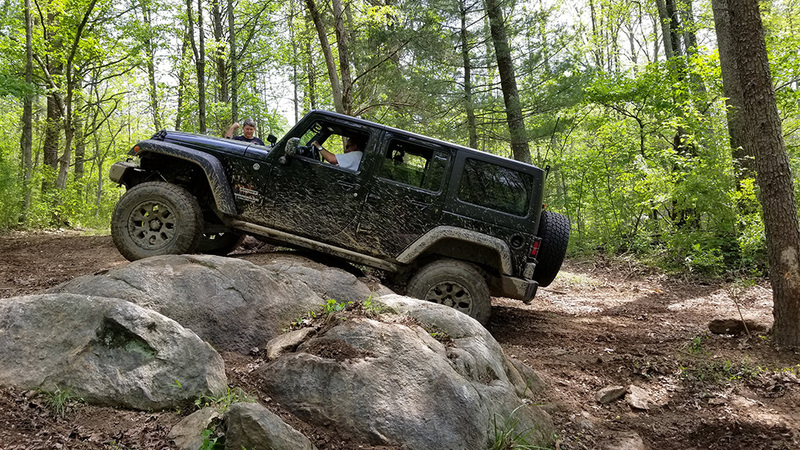 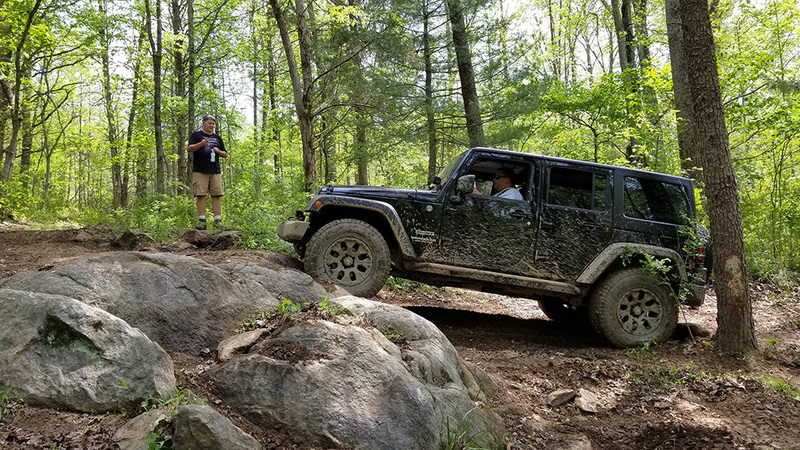 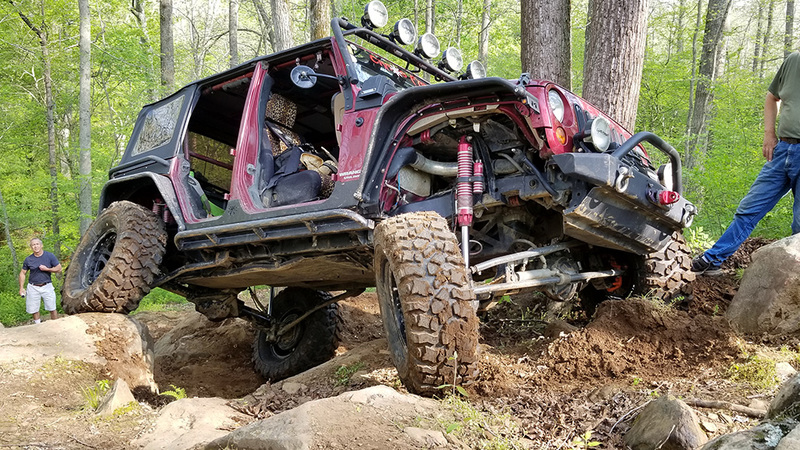 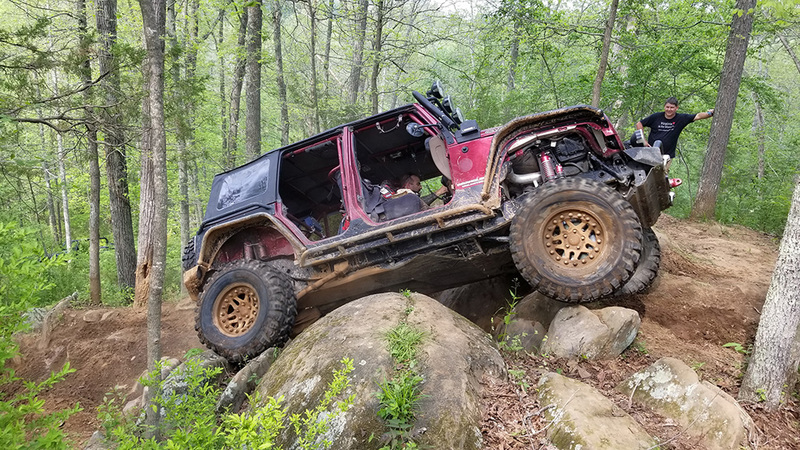 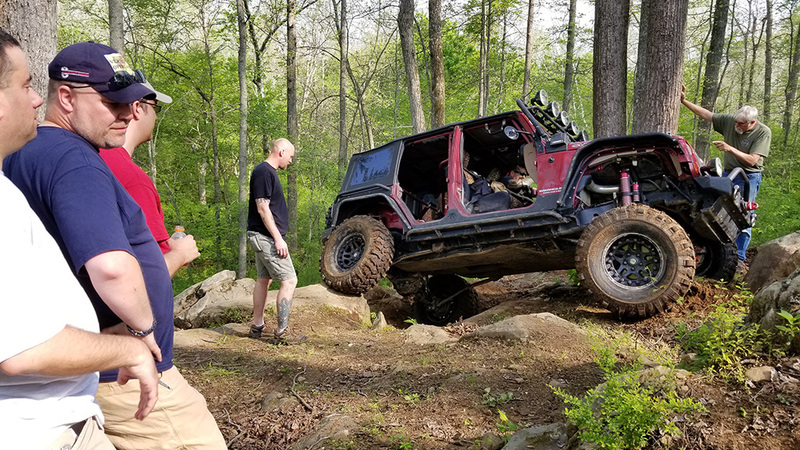 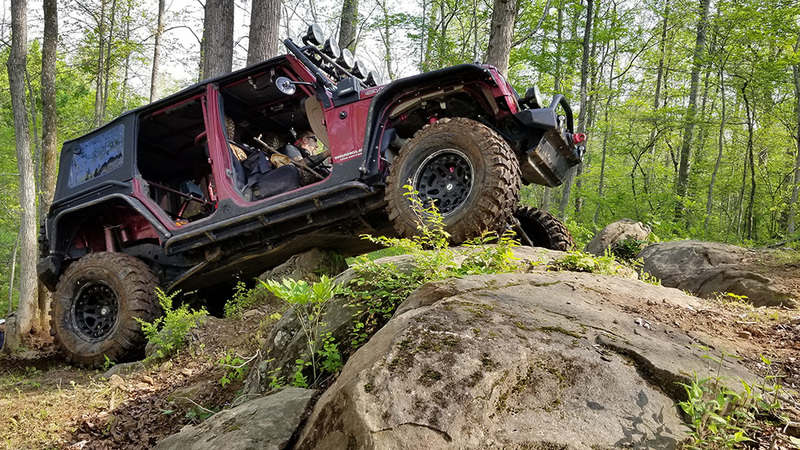 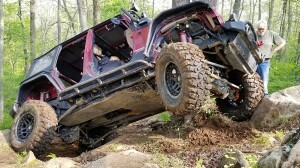 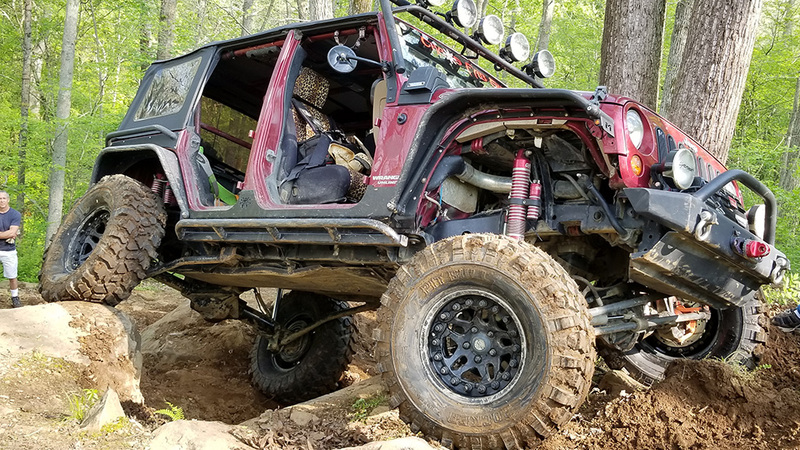 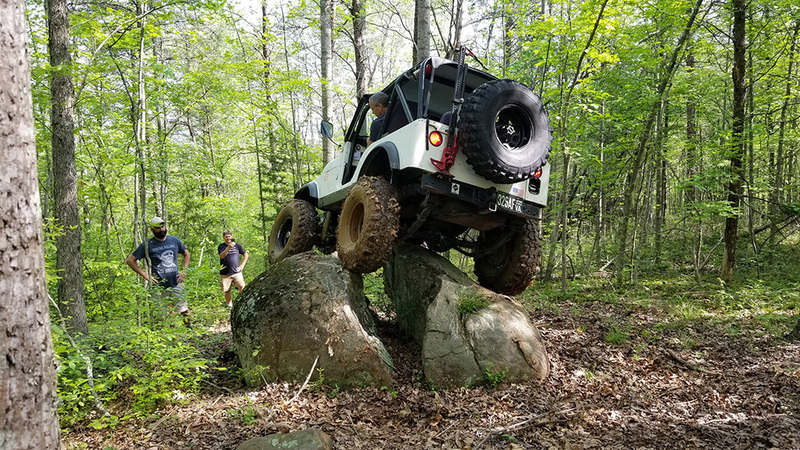 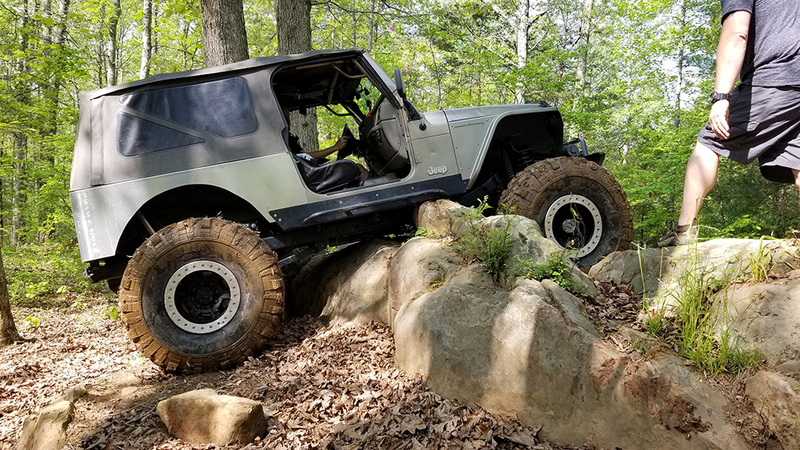 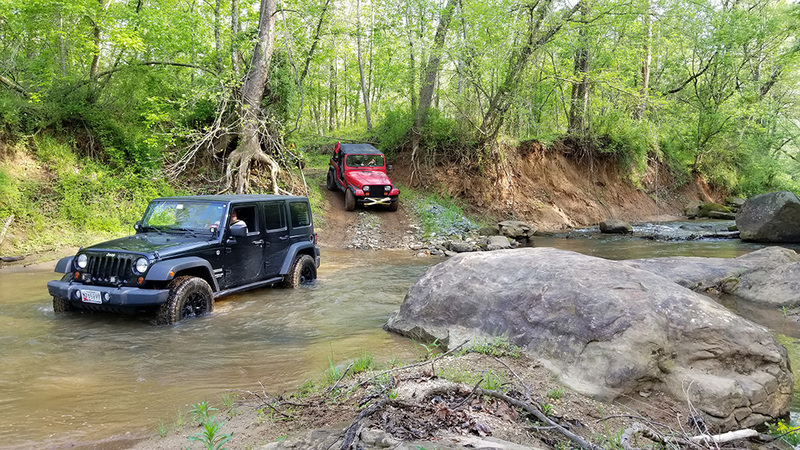 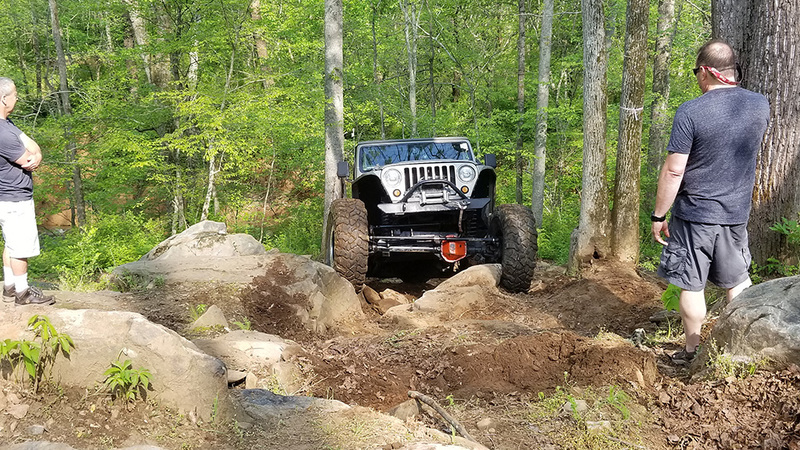 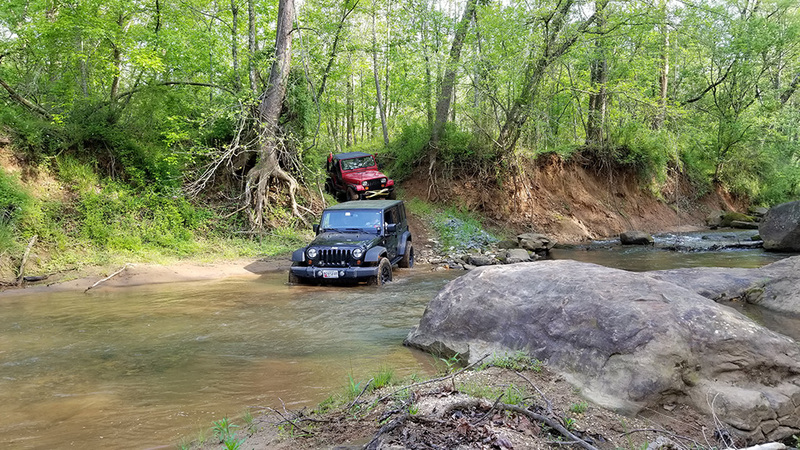 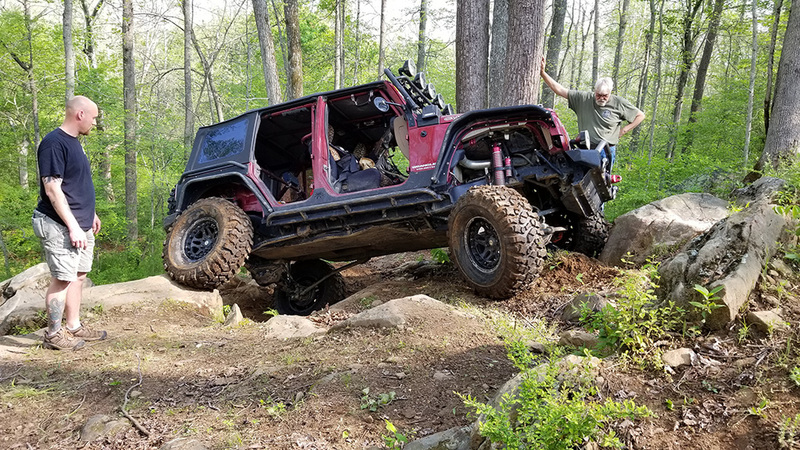 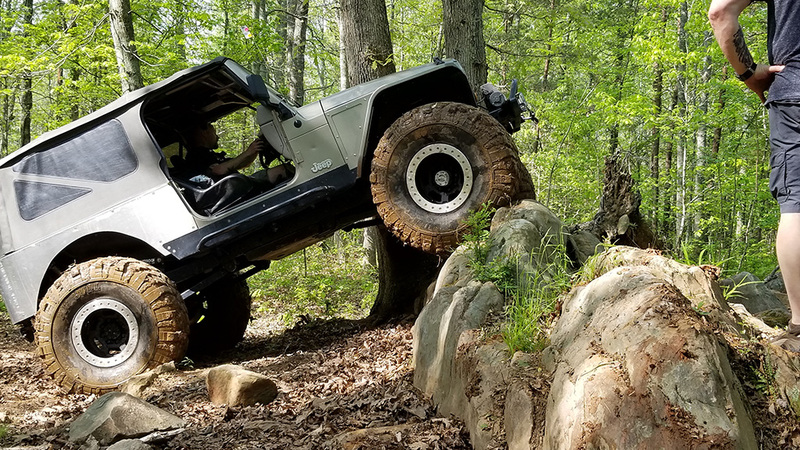 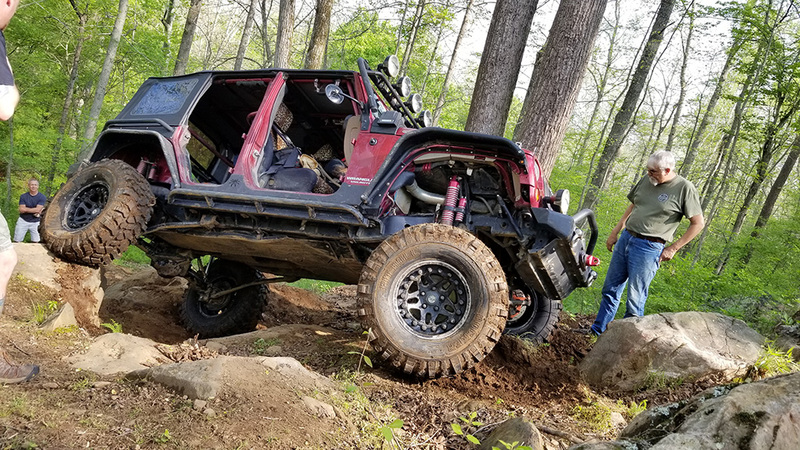 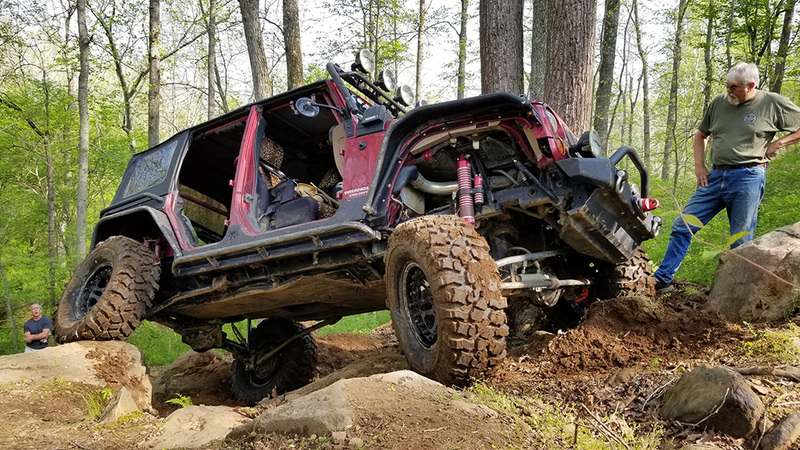 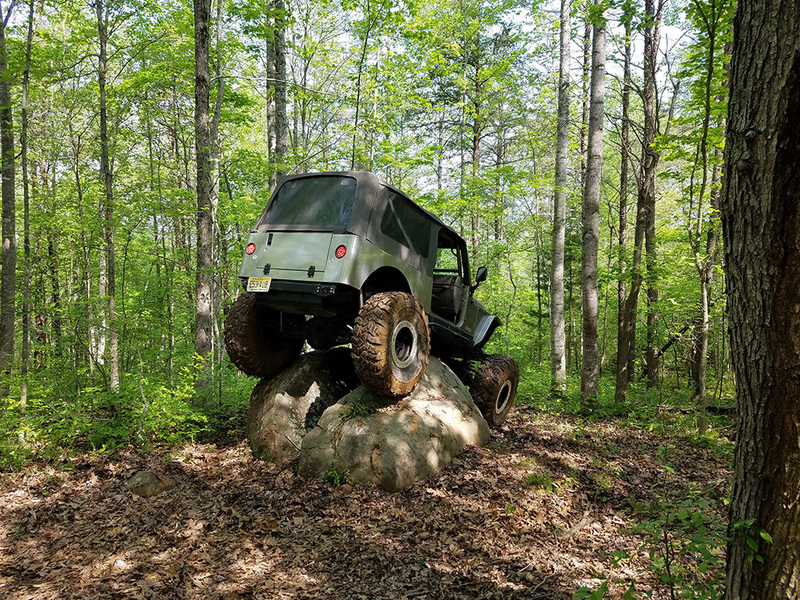 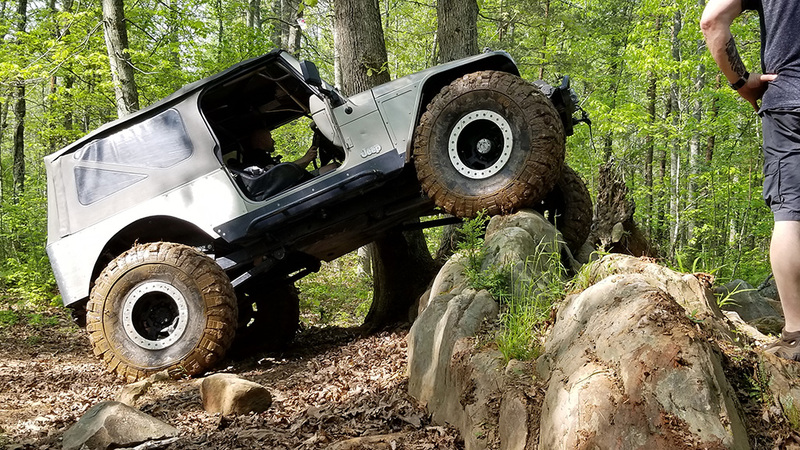 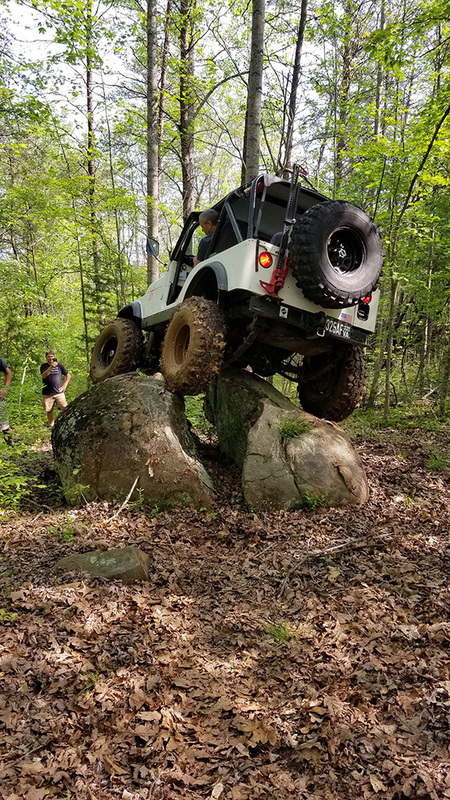 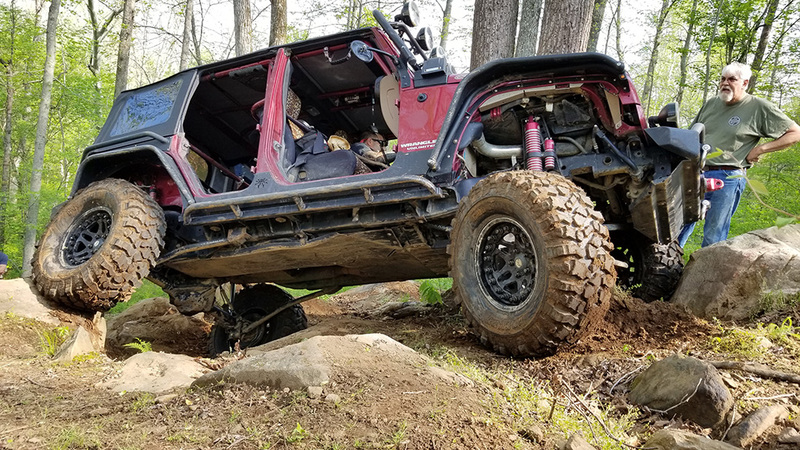 The only one in our group to drive up it was Jeff in his Chaos built JKU “Cherry Bomb” which sits on 37’s and has a driver who is not afraid of damage. 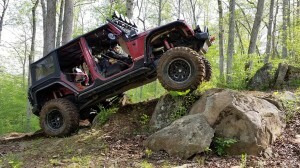 He powered Cherry Bomb right up through V-notch which was most impressive! Saturday night we enjoyed the catered dinner provided by the event and participated in the raffle. 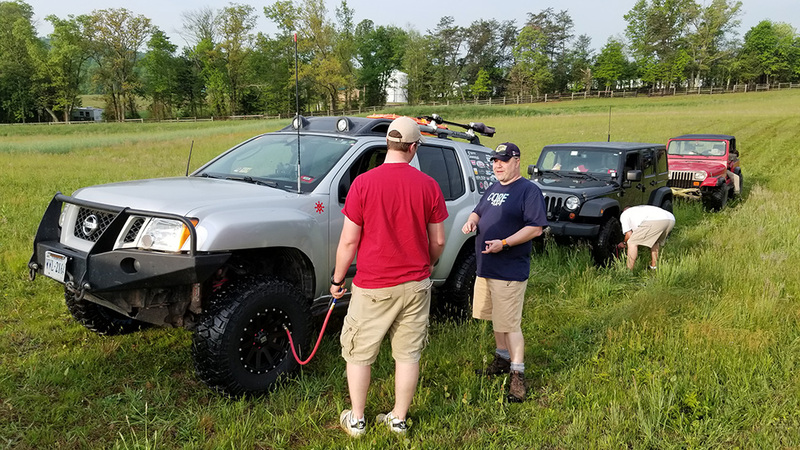 Once again the raffle was full of many high dollar items such as winches. 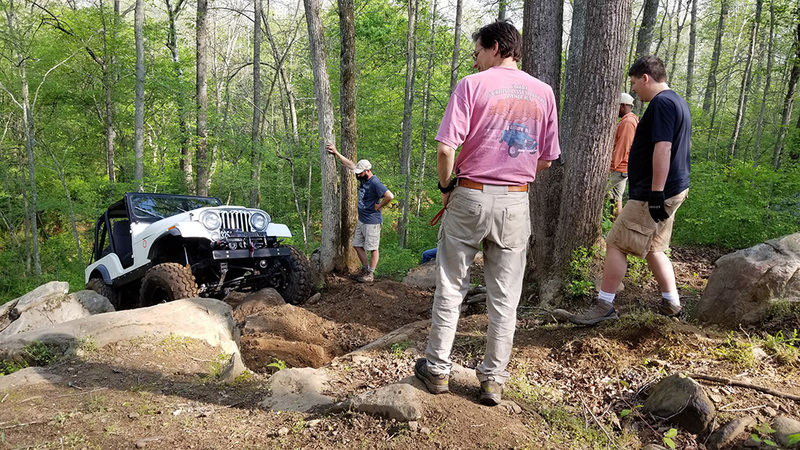 Although CORE members didn’t walk away with any of the prizes this year the event raised $25k that will go straight to cancer research. 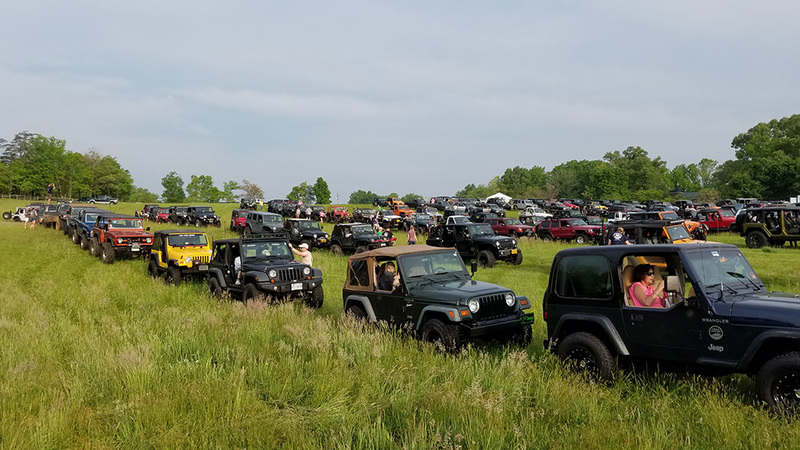 Over the 9 years of this event they have raised nearly $150k. 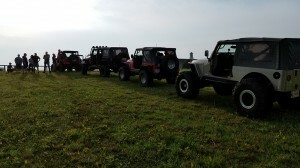 This is such a great way for the wheeling community to give back to the community while having fun. Sunday morning Robert provided the breakfast. 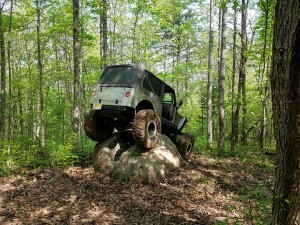 It was a similar breakfast scramble, but of course cooked on his skottle! 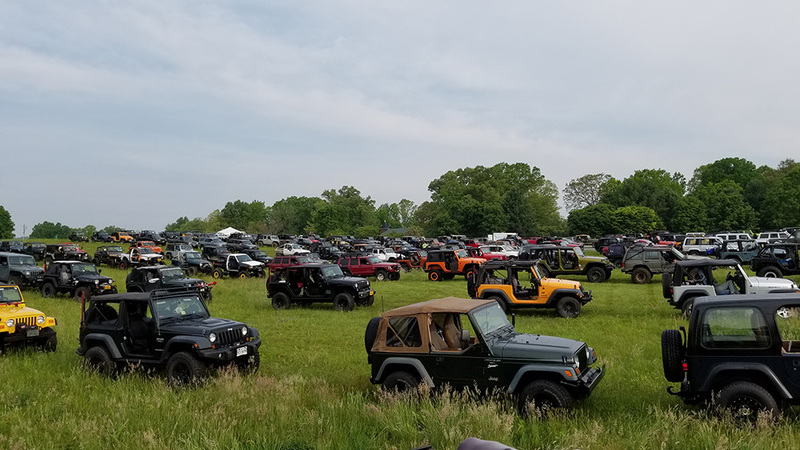 No one left hungry. 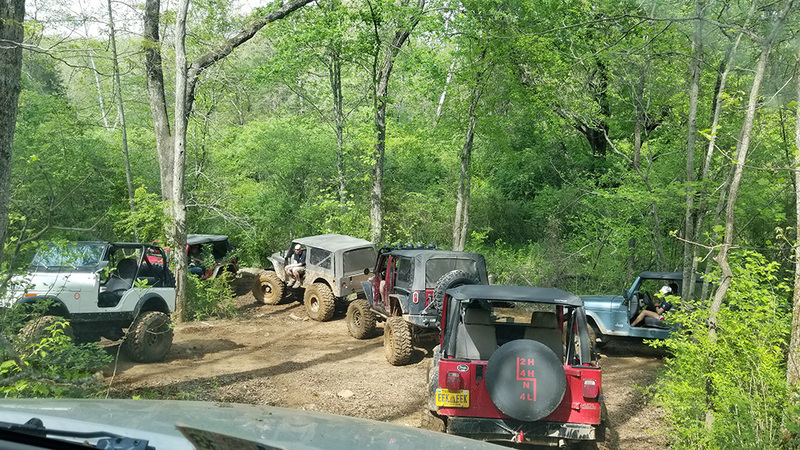 Day 2 is always a half day and always has fewer people so the groups can get shuffled a bit. Our group absorbed 2 nicely built early Bronco’s that were a pleasure to watch. 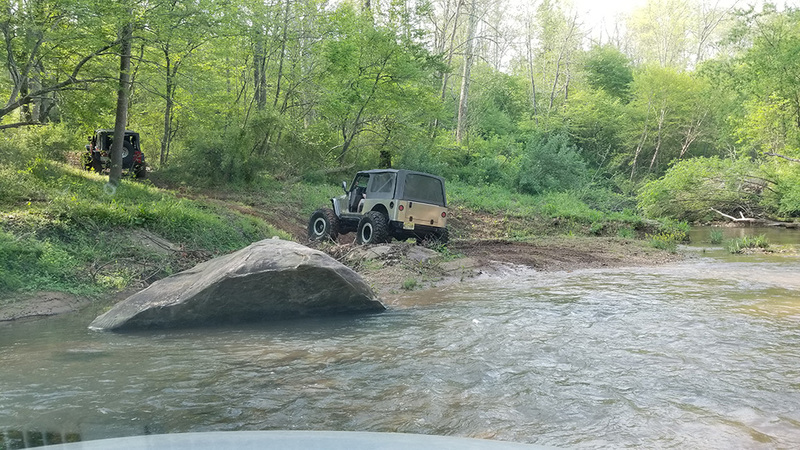 Sunday would not be kind to Jay’s YJ however. 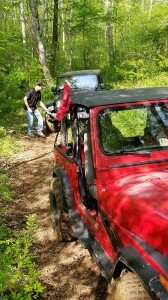 On a mild trail while going over a small rock he came down onto the muffler crimping the end nearly entirely shut! 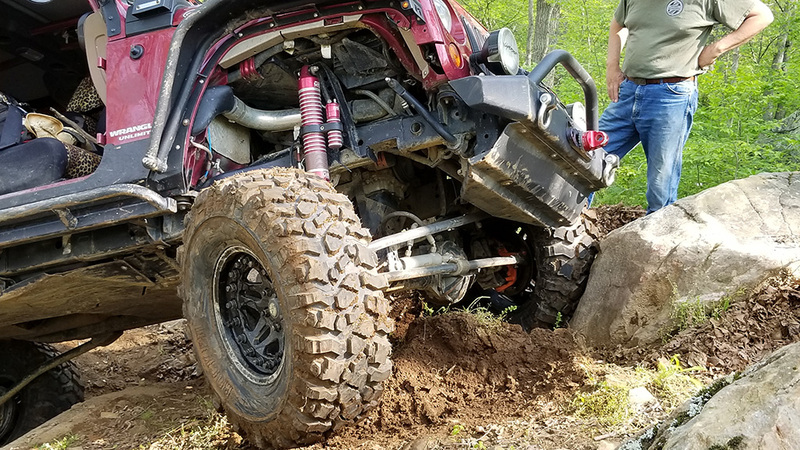 We got out and with a prybar and vice grips bent it back open enough for the engine to run. 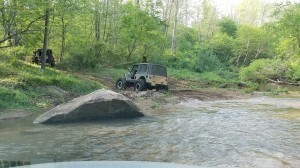 We hopped back in the vehicles and not 200ft later Jay over the radio was mentioning a brake issue! 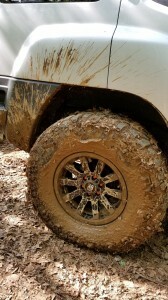 We get out to find brake fluid sprayed all over his front driver side tire. Apparently those 20 year old brake lines had dry rotted and finally given up! 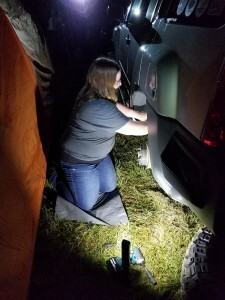 With help from the group we folded the brakeline back on itself and crimped it as closed as we could with vice grips, and kept going. 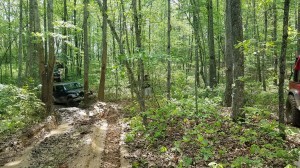 At the end of that trail Jay decided to head back to camp (we were just around the corner) and by the time we got back we got word he had made it the whole way home without issue. 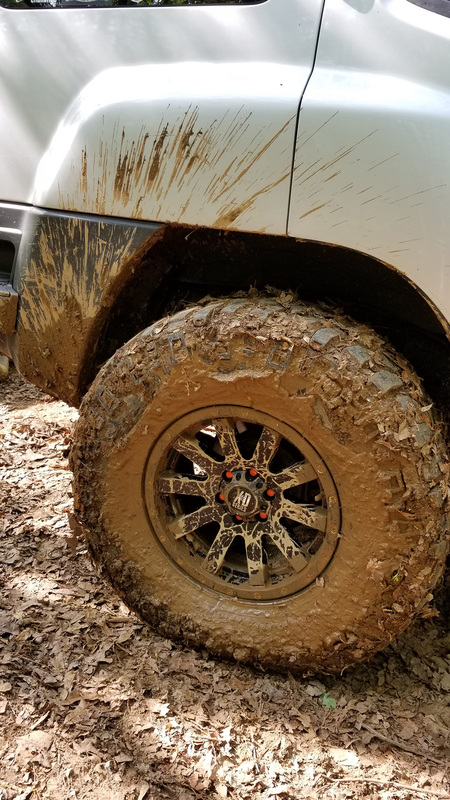 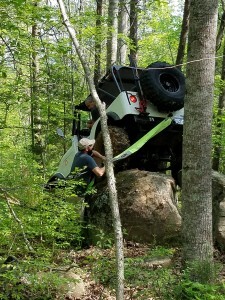 Anyways, our day would include Z-ditch which Sam’s JKU was just long enough to get wedged into. 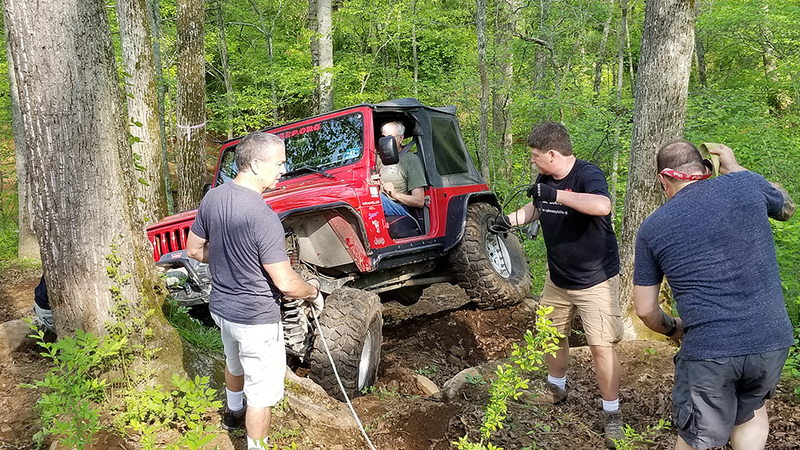 Cherry Bomb came to the rescue with a side pull to get him going again. 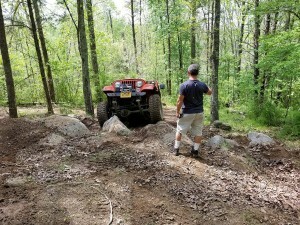 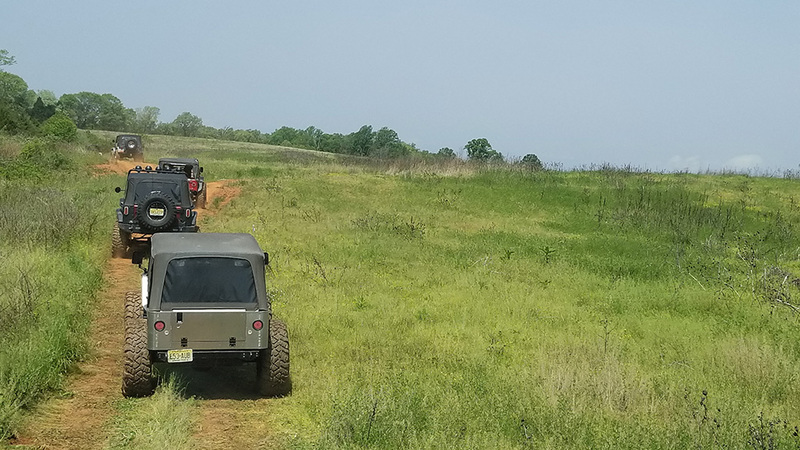 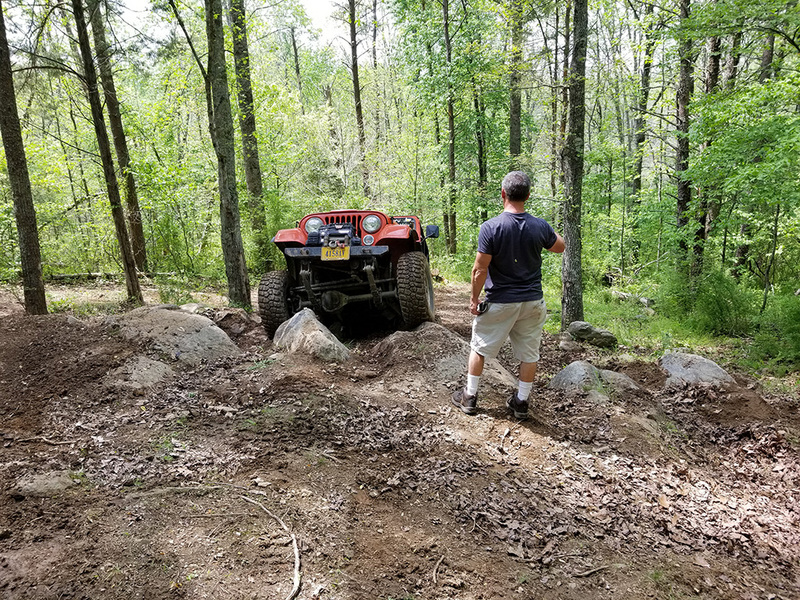 We also hit several other trails including CJ-5. 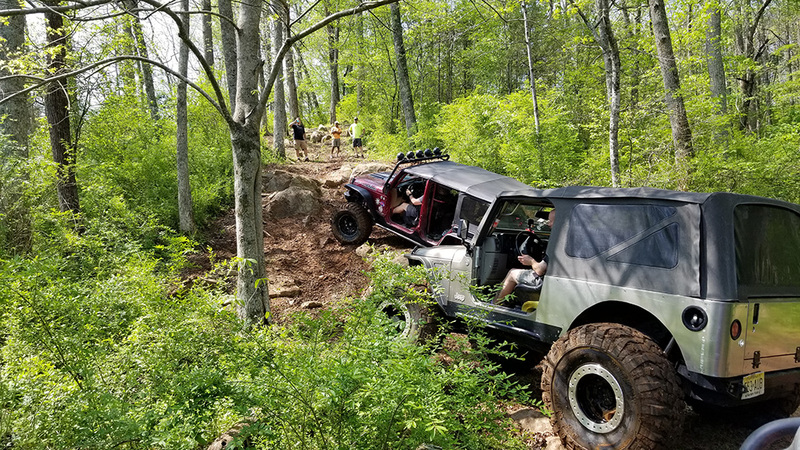 After everyone was up CJ-5 our two guides stopped for a pic of their Jeeps at the top together. 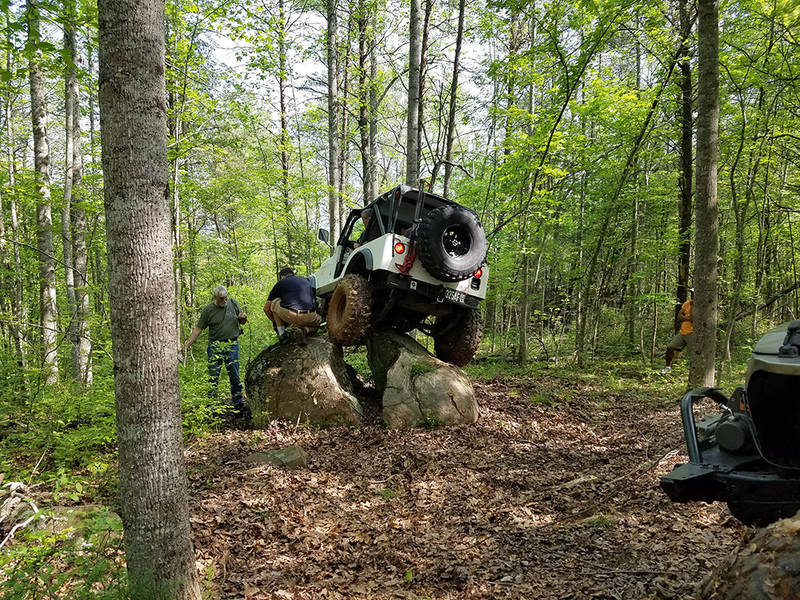 That’s when we learned that 19 years ago in the original group to go up this obstacle only their two vehicles were able to make it unaided. 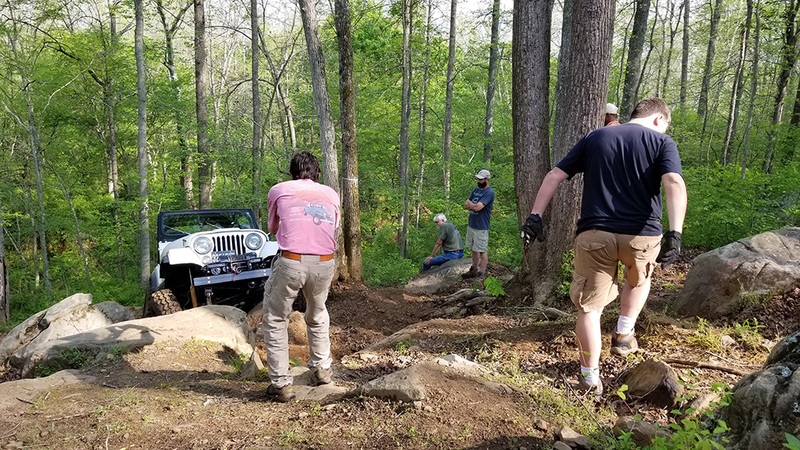 And that was the day the obstacle became known as CJ-5 hill. 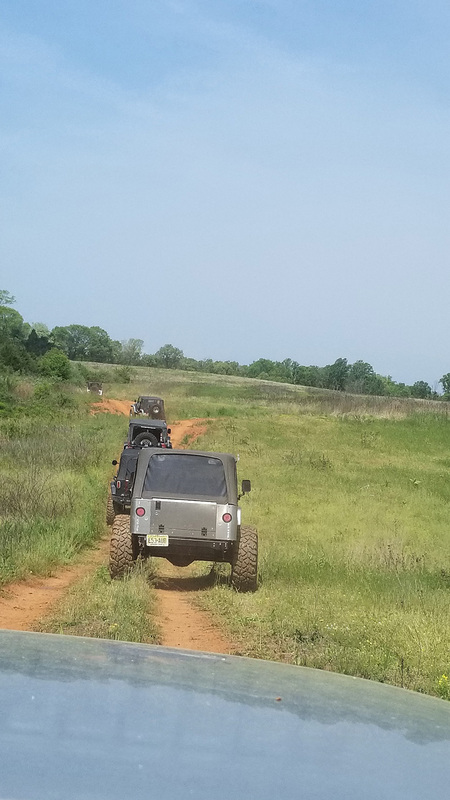 Around lunchtime we decided to call it a day and the group disbanded and headed back to camp. 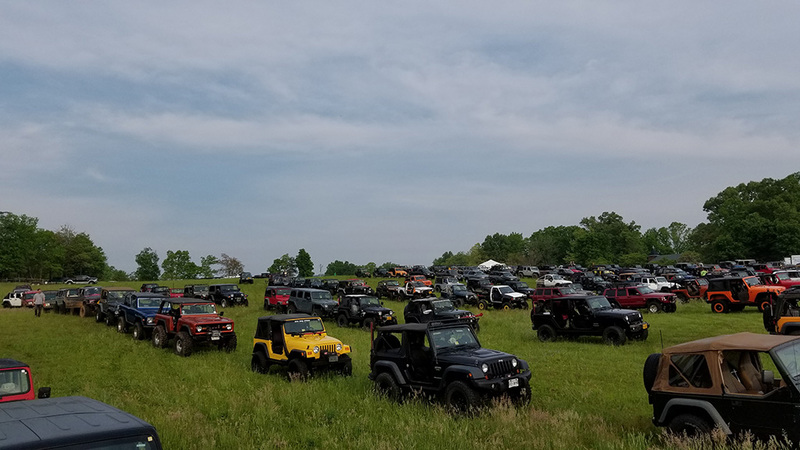 Thanks again to everyone for a great event. 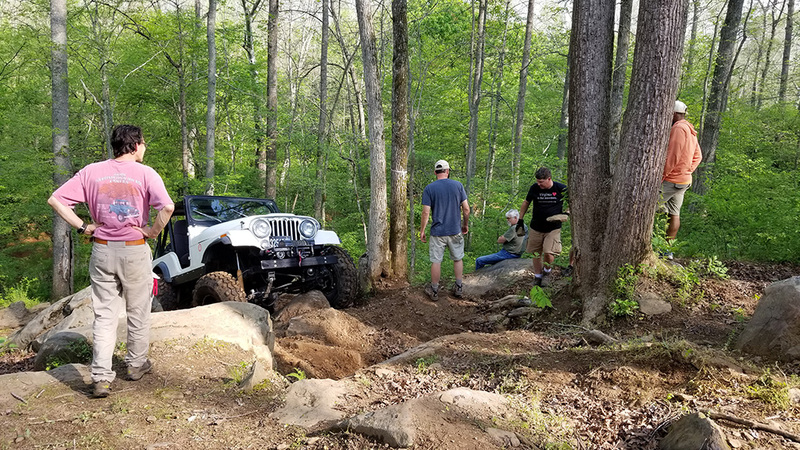 It’s always nice to get to come out and have a good time on these great trails while helping others at the same time. 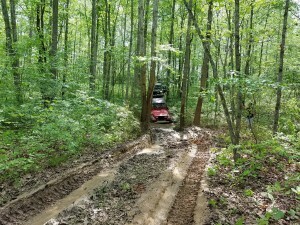 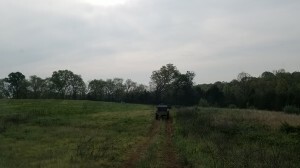 Trail report written by Andrew Taylor. Pictures courtesy of Andrew & Cherie, Sam, and Robert.